Stored for historical purposes only. This rendering represents the original concept that was later modified by the NCC. 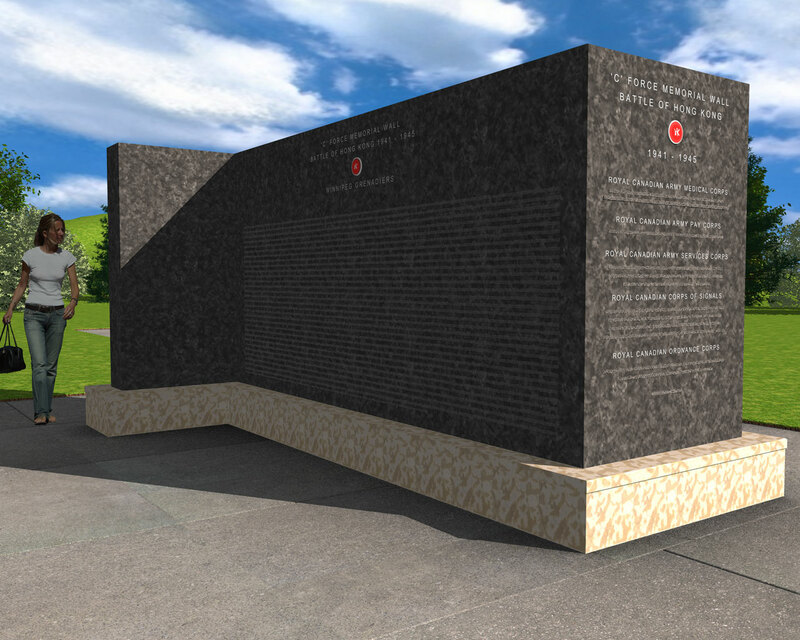 Proposed design is black granite, 12 feet long by 6 feet high by 1 foot thick with 2 end walls 4 feet by 6 feet by 1 foot thick with a 1 foot white granite base surrounded by a patio 10 feet by 15 feet. Ottawa, Ontario - National Capital Commission (NCC) land with easy accessibility for the public. As members of the Hong Kong Veterans Commemorative Association, we hope that you will solicit funds from individuals of the HKVCA family and friends towards the Memorial Wall. Please use this UPDATED brochure with your request as it contains the information that a donor would like to know. Also available in Chinese.